Technical Director ... Lawrence R. Houbre, Jr. Lighting Design ... Lawrence R. Houbre, Jr. 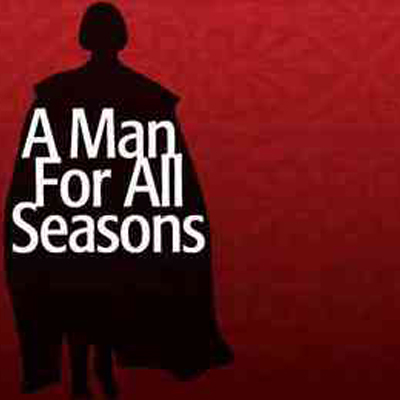 This tragic historical drama offers a brilliant portrait of Sir Thomas More in his last years as Lord Chancellor of England during the reign of Henry VIII. When Henry fails to obtain papal approval for a divorce from Catherine of Aragon to marry Anne Boleyn, he mandates his subjects to sign an 'Act of Supremacy' making him both spiritual and temporal leader of England. Sir Thomas cannot in good conscience comply. Cromwell, Cardinal Wolsey, his family, and the King himself are all unable to convince More otherwise, as he maintains his integrity and belief in silence. Ultimately accused of high treason, this very silence leads the man to his execution, and later his canonization in 1935.